Follow the steps to create an image based on the example shown before starting your project_02. Follow the steps below to recreate the example image from text and drawn elements using Illustrator. Download this practice file and follow the instructor’s directions (or this PDF) to practice with the pen tool. The first part of this tutorial uses basic tools and techniques to take a word and have each character in that word visually represent the word’s meaning. Launch Illustrator. Choose File>New, Name: your last name-ex1, Size: Letter (portrait); Units: points; Advanced>Color: RGB. Click OK. Choose File>Save As “your last name-ex1.ai”, and save the file to your hard drive, leaving all default Save options checked. Note: Clicking with the Type tool results in a single line of text that will expand as you type. Clicking and dragging out a box creates a defined-width within which the type will wrap. You can alter text characteristics from the Control Panel, the Character Panel from the Control Panel, or the Character Panel from Window>Type>Character. To change text attributes, highlight the text with the Type tool. Select a typeface from the Font Menu and a style from the Style Menu(such as Bold). Change the font size to 48pt. To get the highest degree of control in manipulating the look of the type forms, we will create vector outlines from our word “melt”. Choose View>Fit in Window (command-0) to see your entire page. Pick up the Selection tool and click on your text. With the Selection tool, shift-click on a corner of the text’s bounding box and drag outwards until the word measures about 5″ wide. Zoom into the text, by dragging a box around it with the zoom tool, so it will be easier to manipulate the individual points. Note: I recommended using ⌘+ and ⌘- and ⌘0 rather than using the zoom tool. With the Direct Selection tool, click on an empty part of the page to deselect any selected object. Then, click on the outline of the “m” character to reveal the points that make up the vector shape. Note: If you select the inner black area (fill) of the character, all points of the object will be selected at the same time. Moving one point will move them all. Conversely, if you select the outer edge (outline) of the character, all points will be revealed, but none will be selected. You can then click on an individual point (or shift-click on multiple points) to move around or reposition Bézier handles. Drag one of the points around and see how it changes the shape of the character. If you select one of the points that sits along a curve, you will see the point and its Bézier handles, which control the direction and magnitude of the curved segment going into and out of the point. A typical Bézier curve – a point in the middle and two Bézier handles on the sides. We could make our letter M appear to be partially melting by solely manipulating its existing points, but to have more control, we will add more points. With the Direct Selection tool, click on an empty part of the page to deselect any selected object. Click on any section of the outline of the M character. Pick up the Pen tool. Click on the outline of the M, on the underside of the arcs, to add points (see below). Note: When you hover over a segment between two existing points, the Pen tool becomes the Add Anchor Point tool. The Add Anchor Point tool is normally hidden under the Pen tool, among other variations of the tools. There is no need to pick up these tools individually. All can be accessed while working in your document either by placing the Pen tool over certain objects or by holding down modifier keys (e.g. option-click with the Pen tool to use the Convert Anchor Point point tool). Click on a straight segment to add sharp corner points. Click on a curved segment to create a curve point with direction handles. Option-click with the Pen tool to convert a corner point to a curve point (or vice versa), or option-click on a direction handle to move it independently of the point’s other handle. Continue modifying the M to look like it’s ink is dripping. Every shape has stroke (a line around the shape) and a fill (what the shape is filled with). Deselect any selected objects by clicking with a selection tool in a blank page area. Set the Stroke to None and the Fill to black. You can quickly do this by restoring the defaults (small white fill and black stroke button), selecting the stroke box, then clicking on the None button (square with red line through it). Pick up the Pen tool. Our first drop will consist of a corner point (at the top) and two Bézier curves on either side (to create the rounded bubble at the bottom). Click once where the uppermost corner point will be. Below the first point and to the right, click-and-drag to create a smooth curve point. Drag out in the direction that you want the curve to take. Directly to the left click-and-drag another curve point. Finally click back at your starting point to finish the shape. You may need to clean up your shape using the direct selection tool. Pick up the Brush tool. Creating shapes with the Brush tool is very similar to drawing shapes with a real brush on paper. Try drawing a drip shape by clicking and dragging the brush around into a shape. Try to end you shape where you began it. If you are getting unexpected results, try changing the size of the brush by going to the Brushes Palette Window (choose Window>Brushes). Pick up the Pencil tool. The Pencil tool can be used to both create and edit shapes. Here we will be using it to create a drip, but later on we will use it to edit some more complex shapes. Create a third drip shape in a similar manner as you made the second drip with the brush tool. Remember, you can always edit the individual points of these shape if you wish, with the Direct Selection tool. • Use the Warp tool to spread the points of the E character’s outline around to appear melted. The warp tool is used to move around all the points in an object that fall under the tool’s brush size. You can compare it to the Smudgetool or the Liquefy>Forward Warp tools in Photoshop. Pick up the Direct selection tool and click on the “E” character. We do this because we want to tell Illustrator which points will be affected by the warp tool. Pick up the Warp tool from the tool bar and then double click on it. This will bring up a dialog box which will give you more options for the tool. In order to get your desired effect you may need to adjust the brush Width and Height options. This is the Warp Tool Options dialog box. Trial and error may be required to get your desired results. Once you have your settings made (you can try the above settings as a starting point), click OK and drag the warp tool over your points in the E character. This is a before and after screen shot of the Warp tool’s effect. The more points an object has, the smoother the result will be. You may want to clean up the newly warped shape or add some more drip-like shapes with the technique shown in Step 4. The Envelope Distort tool will let you create a grid over the object which you can manipulate to alter the object within. Pick up the Direct Selection tool and click on the “L” character. Go to Objects>Envelope Distort>Make with Mesh. This will open up an options box (see below). The Envelope Mesh options box. Depending on the level of detail you want to work in, create more or less rows and columns for the Envelope Mesh. Try Rows=3 and Columns=2. Check the Preview box to see what the mesh will look like. The 3×2 grid over the “L” character. Pick up the Direct Selection tool and use it to manipulate and move around the various points of the grid. This is the resulting shape after dragging around the envelope mesh’s points. Play around and see if you can achieve a visually effective product. You can “apply” the mesh to the object by choosing Object>Envelope Distort>Expand. This permanently fixes the effect on the object and removes the mesh, enabling further editing with other tools. First pick up the Direct Selection tool and click within the “T” character. Pick up the Free Transform tool. Click or shift-click on a bounding box handle to change the scale of the shape. Rotate the object by moving the cursor outside of the bounding box and then move it down by clicking and dragging inside the box (see below). Pick up the Knife tool (it may be hidden under the Eraser tool). The knife tool allows the user to cut through fills or paths. If you cut something in half, you will then have two pieces to work with. With the Knife tool, draw a horizontal line across the T at the same level as the bottom of the rest of the characters (see below). Notice how you have created two separate objects. Now pick up the Direct Selection tool, click on a blank area to deselect any objects, then click on the bottom half of the character. Press the delete key on the keyboard. Next we will create a shape that looks like a puddle. We will use the Pencil tool to edit a shape. Pick up the Ellipse tool (it may be hidden under the Rectangle tool on the toolbar). Now create a short and wide ellipse at the bottom of our T character (see below). This elliptical shape does not look like a very realistic puddle, it’s too perfect. So we will use the Pencil tool to change its shape. With the Pencil tool you can edit preexisting shapes by having your shape selected and drawing over the parts you want to edit. Make sure that the ellipse is still selected, then pick up Pencil tool. Simply draw over the outline of the ellipse into a more organic shape. You may want to do one half of the ellipse first, then the other half (see below). After this is complete, you may have something that looks similar to the image below. Pick up the Rectangle tool. Make sure that the Fill is set to black, then draw a rectangle beneath your word, as wide as the word, and about a half inch tall. Pick up the Type tool and click at the left side of the black box. Set the fill to white and stroke to None. Type the definition of melt: “melt: to become altered from a solid to a liquid state”. If the text is too large or too small, alter its size in the Characterpalette. Click with the Selection tool to deselect any objects. Pick up the Rectangle tool and draw a rectangle around the the work (see below). In the Layers panel, rename Layer 1 to “melt”, and Lock the layer. Create a new layer to continue with Part II. Now we will explore more advanced Illustrator techniques. We will work on the same theme with part two, but instead of using the word “MELT” we will use the word “PLUNGE”. This is an example of what we will do in PART II. The concept is to have the letters in the word plunge appear to be throwing themselves off the edge of a cliff into a sea of random letters. First, notice how the words PLUNGE are not in a straight line. This look is created by using the Type On A Path Tool. Before typing on a path however, we need to create a path. To start, make sure that you have the Stroke set to Color (the actual color used does not matter) and the Fill set to None. Pick up the Pencil tool and create a large wavy line that looks similar to the one below. This will be the path that our text will be written on. Pick up the Type On A Path tool (it may be hidden under the Type tool) and click on the leftmost portion of your wavy path. Notice how the blinking cursor is now set on the path. 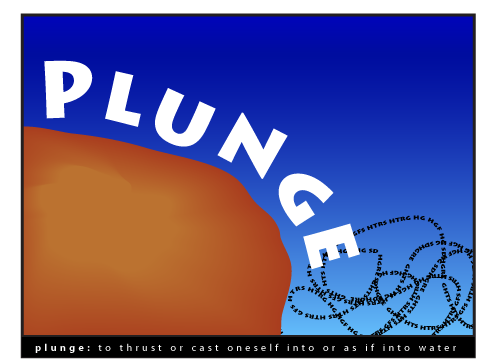 Type the word ‘PLUNGE’. You may need to adjust the size of the lettering. The font can be any one you choose. In order to separate some of the letters, try inserting a space between the letters N and G, and a space between the letters G and E.
We now need to create the cliff object. We will do this by creating two basic shapes and then blend them together with the blend tool. Before we draw our basic shapes lets address the issue of color. Let’s say that we would like our cliff to be a brownish color – there are multiple ways to select a color, but one of the easiest is to first make sure that nothing is selected, and then double click on the Fill box on the tool bar. This will bring up a familiar dialog box where you can choose the color you want. Here I chose a muddy brown. Using what we learned in part 1, draw a basic shape with the Pencil tool (or Pen or Brush, depending on which one you prefer) that resembles a land mass with a cliff on the right side. Notice when the shape is completed that it will be filled with the color that you just chose. Now use the Select tool to deselect your object. Choose a darker brown color as your fill. Now create a second and smaller shape inside of the larger cliff shape (see below). To get these two shapes to blend together we will use the Blend tool. Pick up the Blend tool and click first on the smaller shape, and then on the larger shape. You should see a resulting color blend between the two shapes. Note, you can change blend tool options by double clicking on the Blend tool on the tool bar. Also note that you can select either shape and manipulate it with our standard techniques we learned in this tutorial – EVEN after you have a blend between the two shapes. The next step will be to create a smooth gradated background for the sky. Pick up the Rectangle tool. Make sure you have a color Fill and no Stroke, then draw a large rectangle that covers both the cliff and the letters. Now on the toolbar, select the large Fill box and underneath it select the Gradient Fill box (the one in the middle. see below). This will fill your box with a simple gradient. The Gradient Panel, with Options shown. The first thing we want to do is change our two colors. Select the right hand color (click on the little box at the bottom right) and then double click on the Fill box of the toolbar. To change the color of the linear gradation, after selecting the small box in the Gradient palette, you need to double click on the large fill box and choose the color that you want. Select a dark blue. Then back in the Gradient Palette window click the lighter color of the gradient and then double click on the Fill color of the toolbar again and choose a lighter blue. You will start seeing the results immediately. Finally you are going to want to change the angle at which the gradient is at, so it looks more like a horizon line. So type in “90” where it says ‘angle’ in the Gradient Palette window. The palette window should look something similar to the one below. Now select the rectangular shape, CONTROL click it and go to Arrange>Send to Back. Your composition should begin looking more completed. To create the jumbled sea of letters at the base of the cliff we will use the same Type on a Path tool that we used before. Only this time we will create a long and winding jumbled path and insert plenty of random text so it resembles a sea of floating letters. First make sure that you have a color Stroke and no Fill selected. Pick up the Pencil tool and at the base of the cliff create a winding tangled path (see below). Pick up the Type on a Path tool, select a small font size and then click somewhere on the path, preferably near the beginning of your path. Now you can either copy and paste text from another source onto this path, or just type a bunch of random letters on the keyboard. The objective though, is to fill this path with many letters. Once this path is filled and looks sea-like, you may want to select the brown cliff layer and send it to the front of the image. Your image should look somewhat similar to the one below. There are a couple more modifications to be made so this image will look better. The first is to change the letters in PLUNGE from black to white. You should know how to change the text’s color by now. This will make the image look more balanced. The second change will be to mask out the parts of the image that are hanging out of the rectangular shape (such as some of the letters in the sea, and part of the rounded shape of the cliff. A clipping mask works by selecting two objects and telling Illustrator that the top layer will mask out the bottom layer. Pick up the Selection tool and draw a box around all of the elements in the PLUNGE composition. Group them all together by going to OBJECT>GROUP. Now pick up the Rectangle tool and draw a rectangle over the composition. This rectangle will be the mask – so everything inside of the rectangle will be visible and everything outside of it will be invisible. With the Selection tool, click on the new rectangle and then hold down the SHIFT key and click on the Group that you made earlier. now both should be selected. To create the mask, go to Object>Clipping Mask>Make. Note: You can use this method of creating a clipping mask on any shape or text, and the shape of the mask does not have to be a rectangle. It can be any shape you have created. For example – you could take a passage from a piece of literature, fill a text box with the passage, and then create a shape to look like a portrait of the author. If you used that shape as the clipping mask, then in essence the shape would be filled with text. Play around with this feature. Use the same techniques discussed in Part I to make the end-product of your ‘PLUNGE’ exercise more presentable. Outline the images and set the definition in white text over a black box. For the definition you can choose your own or use: “plunge: to thrust or cast oneself into or as if into water”.